Here is the finished version of the painting I showed you in progress last week. On December 30th I had also posted the small, 8x10 inch plein air painting this painting was rather faithfully based on. 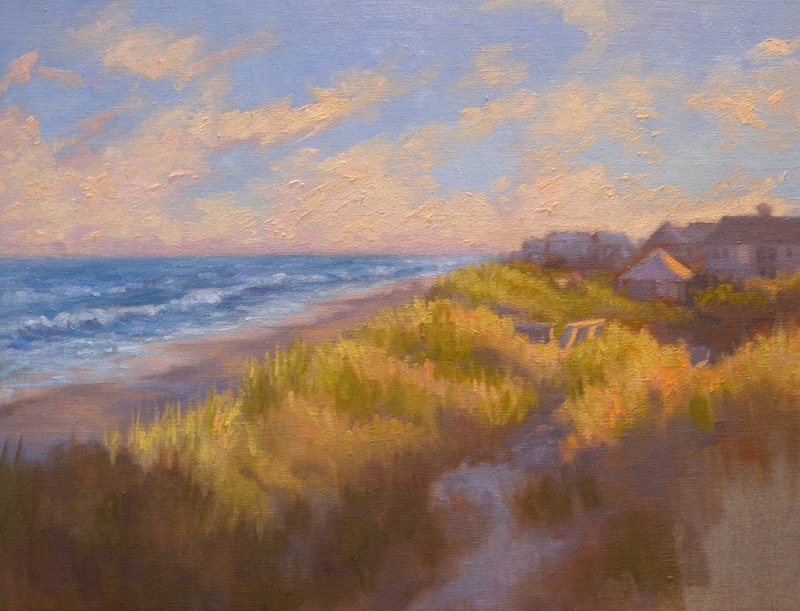 The plein air painting is titled "Deer Track on the Dune" and that post explains the reason for that title. 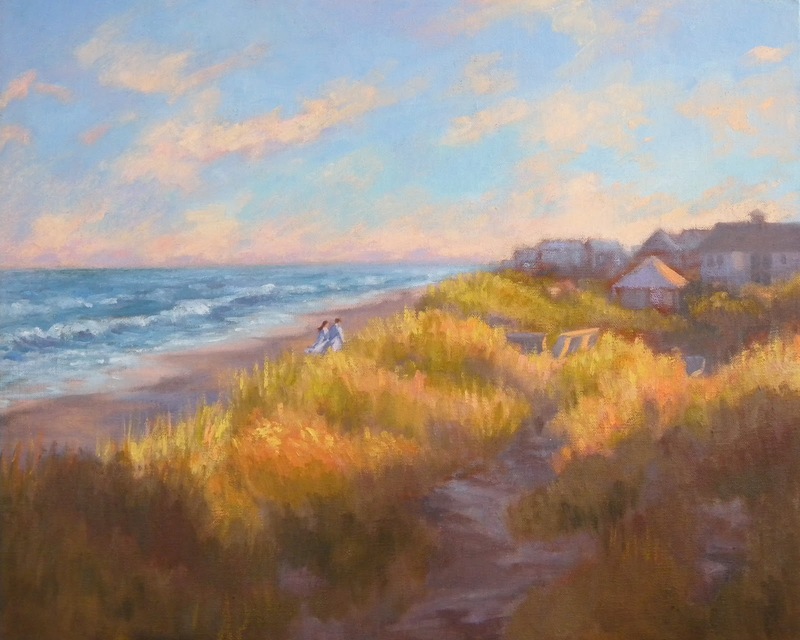 When I started this studio painting I mentioned Iwanted to paint in the couple I had seen strolling up the dune while I was painting. Both of them were wearing long, flowing white terry cloth robes. I had the impression they had been in a hot tub and then took advantage of the mild 60 degree December day to have a late afternoon stroll on the beach after their soak. Having stuck my feet in the ocean earlier that afternoon I can pretty much guarantee they weren't coming in from a swim! In any case their presence in the painting made me want to change the title of the painting and "Lover's Stroll" seemed appropriate. If you look at the earlier post you will see I changed the sky as I mentioned I would. I did in fact sand it down (too much impasto) and removed a good portion of the clouds. There was too much going on in the sky before the changes. I am now happy with the result and am ready to sign the painting. I hope you enjoy it! 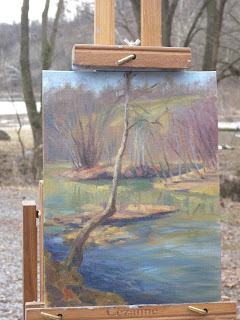 Today I painted at Fletcher's Boat House with the Washington Society of Landscape Painters. 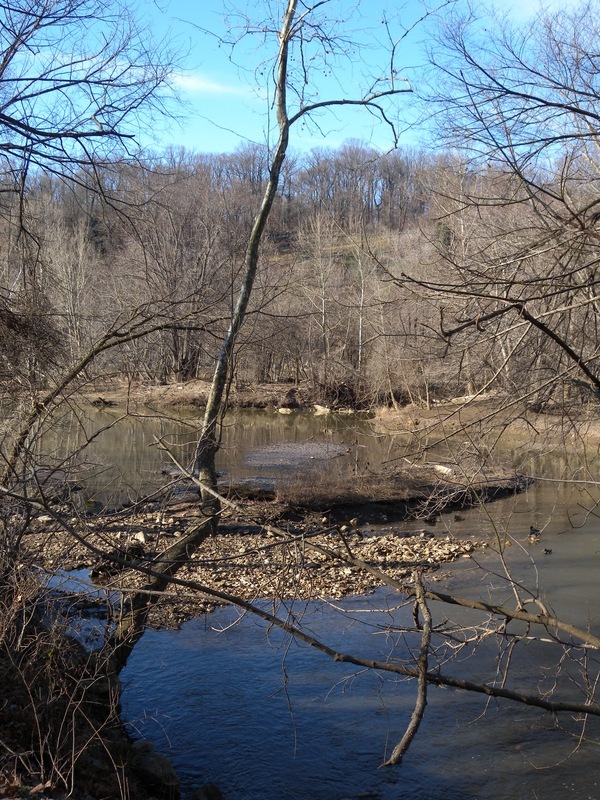 It was chilly but bright, at least for a little while. The light at 9:30 was beautiful and I rushed to get as much of the light/dark areas deliniated because I knew we were in for some clouds. Most of the morning the light was rather flat and gray but I stuck to the brighter palette I started with. Actually I think the painting dulled a little in spite of my attempt to ignore the gray. I will look at it again tomorrow and perhaps liven it up a little. 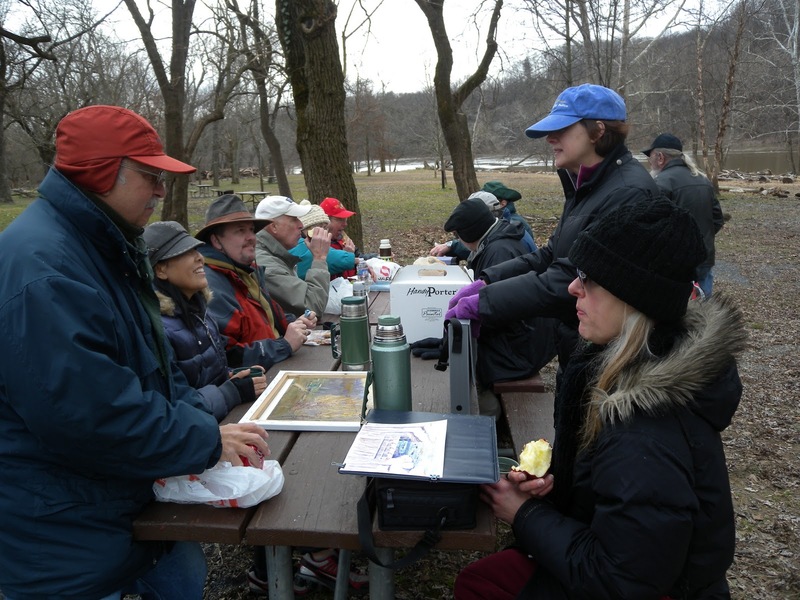 Here is everyone enjoying a picnic lunch. Except for me. I also FORGOT MY LUNCH! This was not exactly the Normandy Invasion for me. Tomorrow I will post the finished "Deer Track on the Dune" as well as the progress on "6th and Constitution". The latter is in its early stages and I have actually remembered to document it. 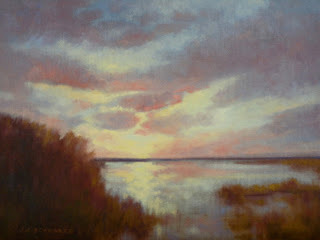 I already showed you the beginnings of "Deer Track" in the post "Revisiting December on the Outer Banks". Last week I came down with the respiratory infection that has been plagueing a lot of people. I think plague is an apt word here. I tried to find the silver lining and get some work done in the studio but I worked at the speed of a snail! At the end of the week I started this enlargement of a plein air piece I did on December 30th on the Outer Banks. You can check the blog entry for that day to see the painting. In any case I had the urge to do a larger one, albeit not a very much larger one. I am staying faithful to my committment to work small this year ergo this is only a 16x20 inch painting. I am painting it on the same kind of linen panel used for the plein air piece. I have come rather far with it and didn't stop to take many 'in progress" photos. Right now I am not too happy with the heavy impasto of the clouds as they come forward too much. The paint is almost dry there so I will do a little sanding and either glaze or just paint more lightly over the area. I may also eat away a little of the cloud mass with some more blue sky. I'll have to see. What I like to do when I have questions like that is to print out a copy of the painting as it is and then use pastels to make my adjustments on the copy. You would be surprised what a great tool that is! It really helps me make up my mind without acting on the original painting. The day I painted the plein air piece there was a couple walking alone on the beach both wearing long, flowing white robes. I would like to paint them into this painting. 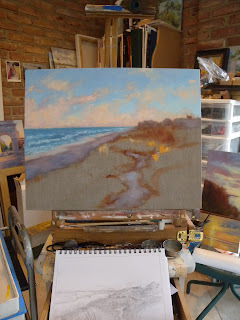 The plein air painting was too small and there wasn't much beach exposed. I will use my copy and pastels to place them before I paint them in. We are having a very gray, dreary spell of weather and it feels so good to work with these warm, saturated colors. I just turn my back on the gray out the windows and look toward the painting. I hope you feel the warmth! "Be Faithful to Art. Its Disappointments Are Transitory; Its Rewards Are Imperishable"
Years ago when I was living and studying in Paris I used to like to go to the bookstalls along the Seine. 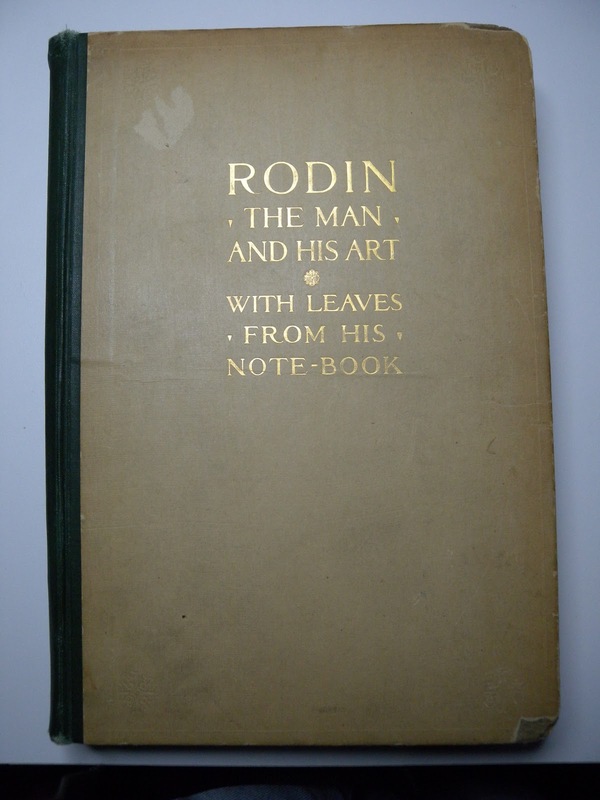 Having been very interested in Rodin's sculptures at the time I was happy to find this volume for sale at a price even a student on a shoestring budget could afford. 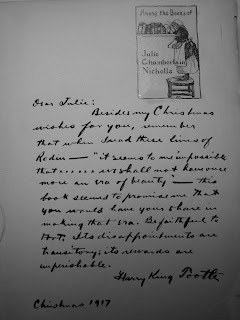 The real find however, was the inscription on the inside of the book. 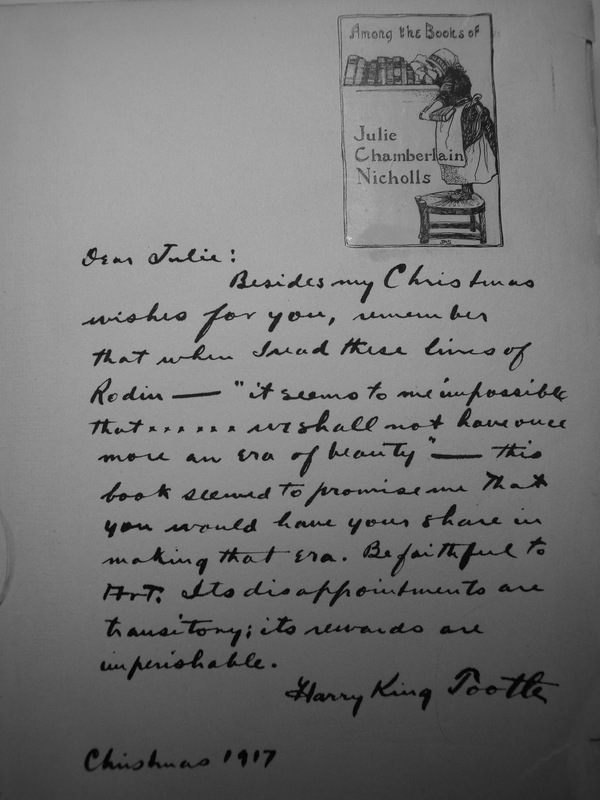 At Christmas in 1917 it had been given to Julie Chamberlain Nicholls as a gift from Harry King Tootle. At the time I could only wonder who these people were and what their relationship might be. Until yesterday I hadn't thought about or read the inscription for years. 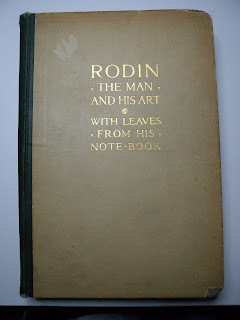 I was going through my old collection of art books that I keep in the upper part of a secretary (those that I refer to on a regular basis I keep on a shelf in my studio) looking for another book but took this one down because I had the desire to thumb through it. Once again I read the inscription and was touched by the words. This time, however, I had a search tool. I headed straight for the computer and looked up both names and was surprised to rapidly find information on both. Julie Chamberlain Nicholls (Yates) was an American born sculptress who went to Paris to study with Rodin in the 1890's. 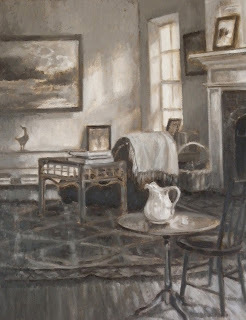 When she returned home she lived and worked in New York where she exhibited with the Society of Independent Artists and was a member of the National Arts Club. She died on Governors Island in 1929. Harry King Tootle graduated from John Hopkins University in 1903, became the Personnel Director for the New York Times and was a short story writer published in the Argosy and Cavalier literary magazines. He lived in Newton Connecticut and died in 1961. Given the fact that World War I was recently over I understood why he chose the words he did about a new era of beauty. I would like to think it would make them happy to know that the book has been owned by a fellow artist for all these years. I have included the inscription here and I hope you take a moment to enlarge and read it. I think it is beautiful! 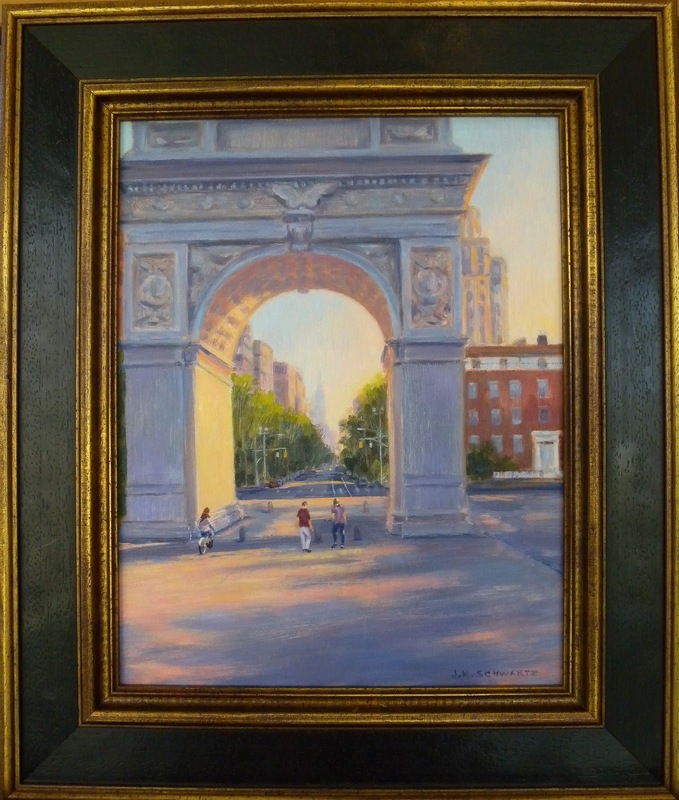 ﻿﻿ Over the weekend I finished the small painting of the Washington Square Arch. It looks a little off kilter here because I have it just taped into the frame to see if this is the one I want to use as opposed to a gold plein air frame. I think I will stick with this one. I continue to find it difficult to stay loose when painting architecture. I am making a point of not sketching it in first or using a straight edge because I need to get away from my years of drafting. I find it quite a challenge. Being literal and specific was required of me as a landscape designer when illustrating architecural elements of a design so I tend to want to correct myself a lot. I think it is more important to let the painting flow and not get hung up on the details but that is easier said than done. I have been spending time looking at Turner's handling of architecture and wishing I could pull that off! I felt the need to get back to more familiar territory so Monday afternoon I painted "Primal" from memory. The place in my mind was Currituck Sound and the sky is like one of many I have witnessed there. I found painting it to be a release. I am in one of those stages where I want to be challenged but at the same time want to feel confident. Painting the Sound is always like comfort food for me. Today I primed two 16x20 panels, one for a DC painting and the other one for an enlarged and embelished version of the plein air painting I did on December 30th. The latter will be on clear primed linen and the DC painting will be on gesso board that I have toned with yellow ochre. I will try to remember to photograph them in progress so I can post them here. I am not doing that just to show YOU my process I find it also helps me to revisit how I painted a particular painting. Honestly, sometimes I just plain forget how I did it! Obviously, this is not going to be a daily blog. I really thought it would be and for a while there I was doing pretty well. I knew better than to make a New Years resolution for it to be. So, judging from the dates, this is shaping up to be a weekly blog, at least for the time being. I do my blogging in the evening and of late I have had a lot of other work to do at night. This is fun the rest of the stuff is work and you know how that works priority wise. I am, however, painting everyday. I have come pretty far with this piece which I had planned on posting from the beginning. Tomorrow I want to add some figures and then I shall put it away for a couple of days before passing verdict on it. This photo was taken under studio lights and the result is a slightly grayed image. I am going for very saturated colors and I hope the next photo I post of this will bring that across better. If you have been reading this post then you might recognize the scene up 5th Avenue seen through the arch. I did a painting in the fall (5th and Waverly) that was the view up 5th Avenue after passing under the arch. There is a bicyclist in that painting heading up the Avenue. She is on the right side of the foreground and I think it would be fun to paint her into this painting just heading under the arch. I may put in another figure or two but I haven't decided yet. I really don't want to put a larger figure in the foreground of this painting and I hope the dark shadow will give enough weight to that area. I'll have to see after I add the other figures. What's next? Well, I would like to do an enlarged, studio version of the plein air painting I did at the Outer Banks on December 30th and I would also like to do a DC street scene. I have been working on a sketch for one along Constitution Avenue. I would like to be working on both at the same time. Why? Because I will probably get stuck on the DC painting and the Outer Banks painting will be more familiar territory for me. Cityscapes are a new venture and I know I will have more success with them if I can spend more time painting on site. Once this busy period in my life is more under control I plan to be spending some time in DC doing just that! 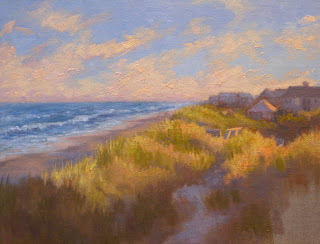 ﻿ Now with the Holidays and my wonderful trip to the Outer Banks of North Carolina behind me I am back to work in the studio. I have spent the week planning, sketching and making some exhibition decisions. 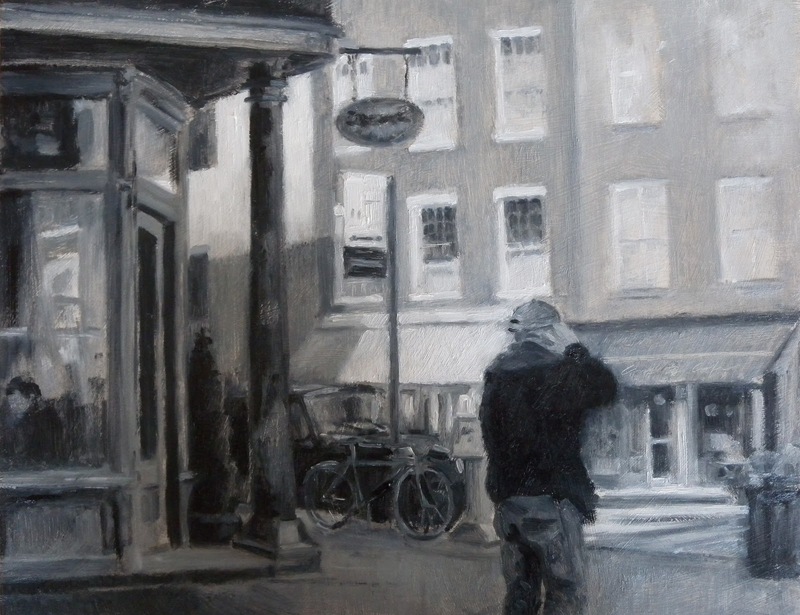 The two tonal paintings I am showing you here are the ones I have decided to send to New York for the Black and White Show at the Salmagundi Club. Some of you have been watching the progress on the sepia painting which I have decided to title "The Artist's Sanctuary" but the other black and white was a last minute painting which I am quite pleased with. 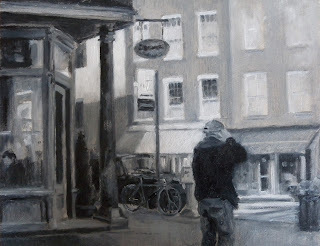 It was based on an afternoon in Greenwich Village. I really liked the strong light and shade as a subject and having lots of interesting forms to play with. ﻿﻿ I am happy to report that all three of the tiny paintings I showed you that I had entered in the Thumb Box Show at the Salmagundi have found new homes. I hope these two for the Black and White Show fare as well. 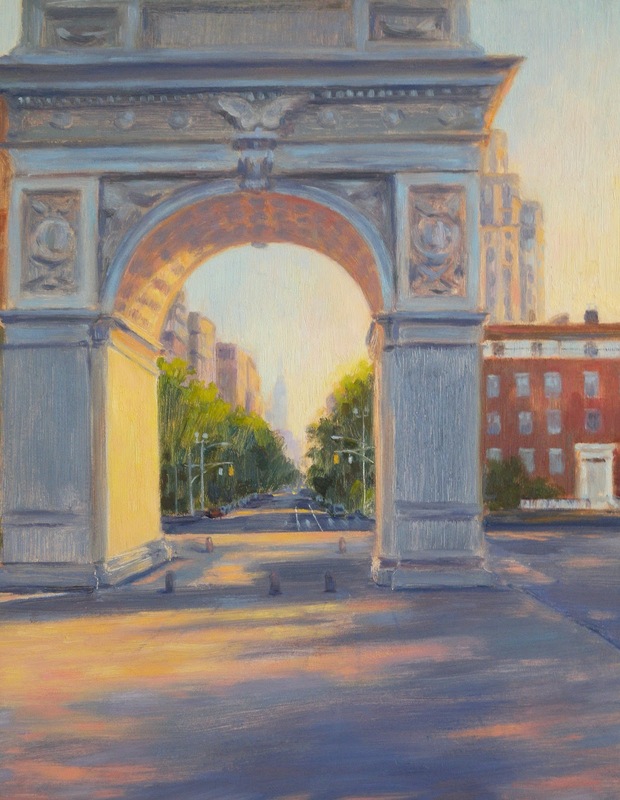 Also on the horizon is the Patron's Show at the Art League Gallery in February and the Spring Auctions at the Salmagundi Club in March. Both of those events are fundraisers for those organizations. I will be sure to give you more information and show you the works that I will have available as soon as I make that decision. Bidding for the Salmagundi auction will also be done online and I will let you know exactly when and how that works. Some of you might be interested in placing a bid.